I love making complex meals with lots of flavor. However, I also have a three and five-year-old. I would like to say that every meal that I make has multiple parts and flavors, but with two young boys and a busy household I split my menu plans for the week down the middle. Out of the seven days of the week that I cook I have at least two days that the recipes are very simple. I don't assign each recipe to a day of the week, I just place the recipe names and list of ingredients on my fridge and decide based on how my day is going what I will make for the evening meal. For those days that I am pressed for time, many of my quick and simple meals involve my crockpot. 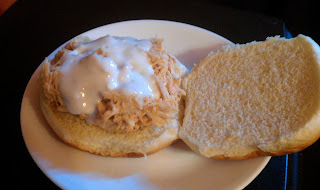 The April issue of Family Circle magazine had a recipe for Pulled Buffalo Chicken Sliders, which only had 4 ingredients and looked very simple and perfect for my easy meal night. This recipe has 4 ingredients. It takes 10 minutes of prep and 8 hours on low in the crockpot and makes 8 servings. As seen in the photos the major change that I made to this recipe was to serve the pulled chicken on Sunny Buns instead of making them slider sized. The main reason I made this change was that my two kids love Sunny Buns and they are the main bread that I use with pulled meats and burgers. As suggested by the recipe I used Frank's Hot Wing Sauce and added more to the pulled chicken when preparing the sandwiches for my husband and I. For the blue cheese dressing I found a new variety that uses yogurt that has very little fat and far fewer calories than the full-fat alternatives. I followed the remainder of the recipe as written. I was skeptical if the chicken breast would be too tough after being in the crockpot all day. Normally I substitute chicken thighs in recipes, but I decided to follow the recipe as written this time. I was pleasantly surprised how tender the chicken breast turned out and the wing sauce was mild enough after being watered down in the crockpot my two kids ate their servings without complaints. I would suggest for adults that like a little more flavor to add additional Frank's once the pulled chicken is on the bun. With four ingredients and 23 grams of protein per serving this crockpot recipe is beyond easy and healthy. I would have thought the chicken would have been as tough as leather after all day in the pot. I'm glad to hear such great results. Sounds yummy. I thought that too, so I was very happy that the meat turned out great! That looks delicious! Thank you for the follow. I am following back and looking forward to your posts that are already making me hungry! Thanks, I try :) I do a combination of easy and complex. I want to expose my kids to a lot of flavors, but I also realize that I can't cook full out 7 days a week or I will drive myself crazy. So when I make my menu plan I include both simple and complex meals, so there is a nice mix.